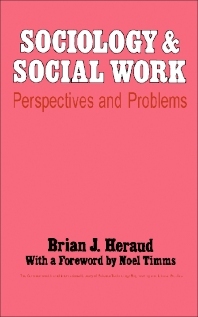 Sociology and Social Work: Perspectives and Problems focuses on the relationship between sociology and social work, providing a sociological understanding of the problems social workers face. This book begins with an introduction to sociology and social work, followed by a discussion on the nature of a sociological perspective. The sociological approach to family and kinship, analysis of the community, social stratification, and social deviance are also elaborated. This text emphasizes child rearing, language, and social class, including childhood as a preparation for class membership and changes in the stratification system. The social functions of social work in relation to social control and social change are likewise reviewed. This compilation concludes with a review of the professionalization and organizational context of social work and problems arising from the nature of social work and sociology. This publication is a good reference for students and researchers interested in the perspectives and problems related to sociology and social work.